Trucks can cause catastrophic injury and traumatize a family for years to come. However, a skilled law firm that focuses on aiding truck accident victims can assist you in obtaining compensation for pain and suffering, medical expenses, and loss of wages. Contact McGarity and Efstration as soon as possible to receive sound legal care. Questions about truck crashes? Our lawyers can help. Are truck accidents typically serious? Unfortunately, yes. In many cases truck accidents result in serious injury and even death. This is because trucks are many times larger and heavier than passenger cars. As a result, these massive vehicles have a hard time stopping. Additionally, because truck accidents can be so serious, you must retain an experienced Gwinnett County truck accident lawyer. Do I need an attorney? Although you do not technically need an attorney to assist you with your truck accident case, a skilled lawyer drastically can improve your chances of success. The law can be extremely confusing, especially when it involves truck accidents. An attorney can gather evidence to support your case, negotiate a settlement, and provide you with excellent advice on how to move forward. Are settlements larger in truck accidents? A trucking accident lawyer can explain that, in most cases, truck accident settlements are larger than other types of vehicle accidents. However, this is because injuries sustained in truck accidents are typically much greater. Therefore, compensation is awarded based on the severity of the injuries suffered. Who is to blame in a truck accident? Unlike other types of vehicle accidents, many parties may be liable for injuries you sustain in a truck accident. First, the truck driver may be responsible if he or she was reckless or under the influence of drugs or alcohol. The vehicle manufacturer may also be responsible if the truck malfunctioned. Additionally, the owner of the trucking company may be at fault for hiring underage drivers, not maintaining the fleet, not performing regular drug tests, or pressuring drivers to spend too many hours on the road. Will I have to endure a long court battle? Most truck accident cases are settled out of court. However, a knowledgeable Gwinnett County trucking accident lawyer can explain that every case is different. As a result, some cases can go to trial. Therefore, it is imperative that you hire an experienced and trustworthy attorney to represent you in your truck accident case. 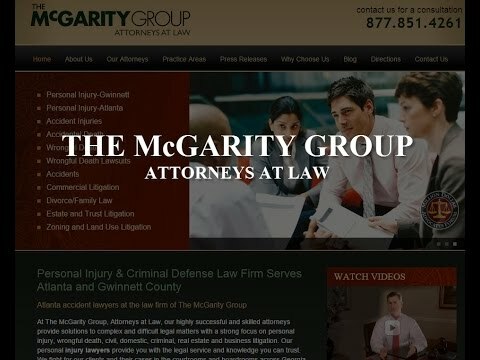 McGarity and Efstration is here for you if you are a victim of a truck accident. Our experienced truck accidents lawyers look forward to assisting you every step of the way. Contact us today by phone at 877.851.4261 or online to receive trustworthy legal care from a team of dedicated professionals.